I’m Jo Stafinbil. I am a graduate of the Metal Arts program at Humboldt State University in Arcata, California. 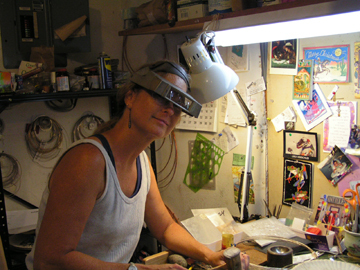 I have been designing and fabricating jewelry professionally for about 20-years now. My jewelry is all hand fabricated. I do no casting, and there is no mass production involved. I currently exhibit my work at about a dozen art shows in the central and northern California area, often with my husband, Richard, joining me. We do our shows between April and December each year. For a listing of our upcoming shows, please hit the “Upcoming Shows” button.